The Kadambas were a royal dynasty that ruled Banavasi in the region of Uttara Kannada in India (the central coastal stretch of the modern state of Karnataka, along with some inland territory). They bore a legendary descent from the prehistoric Cholas, while control of their territory was inherited from the Satvahanas. Although their kingdom apparently only emerged into history in the fourth century AD, they must have existed as a tribe or minor state for several hundred years beforehand, as the Cheras under Imayavaramban Nedum Cheralathan are recorded as having delivered them (sworn enemies) a crushing defeat in the first century AD. 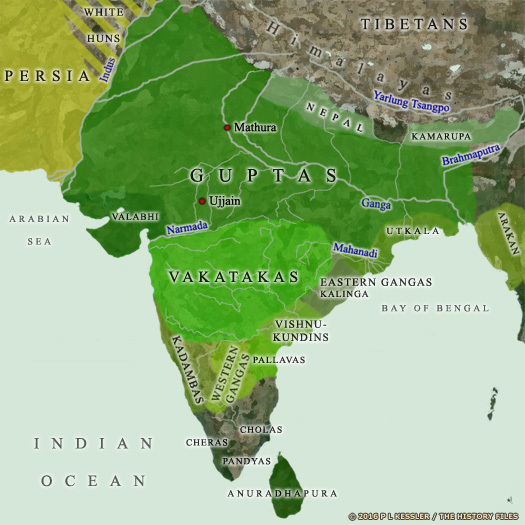 They eventually escaped dominance by the southern kingdoms following the second century AD Kalabhra invasion of that region, and in time they dominated the Cheras, Cholas, and Pallavas. Their rise to true regional power may have been the result of disruption caused by the various fourth century campaigns of Samudragupta Gupta. He seems to have caused a ripple effect that may have lead lead to the emergence of several tribes as minor regional kingdoms in their own right, especially in the more distant south. It seems likely that the Western Gangas in the fairly nearby Mysore region now began to carve out a small but prominent kingdom of their own, and the Kadambas may have similarly benefited. Later, as the Kadambas declined in power, they accepted the suzerainty of the Chalukyas and even later the Rashtrakutas, and managed to rule in Banavasi for a further five hundred years. Subsequent generations also branched out into the regions of Goa and Hanagal, or Hangal. Their language was Kannada, and early dates are approximate. It is said that Mayurasharma's origins are as a learned Brahmin. He is insulted by a Pallava official and, burning for revenge, he raises a army, defeats some Pallava officials and takes control of their territories. He is later reconciled with the Pallava kings and becomes their vassal at Banavasi. Kangavarman changes the family name from Sharman to Varman. He is probably the Kadamba king who is defeated by the Vakataka king, Vindhyasena, who occupies Banavasi for a period. Bagitarha wrests back the kingdom from the Vakatakas of the western Deccan. A fifth century Kadamba record in the Edakkal cave in Wayanad bears witness to the Kadamba presence in the deep south of India. Kakushthavarman is a powerful king who makes matrimonial alliances with the Guptas and other royal houses. One of his daughters marries Skandagupta, while another marries the Vakataka king, Narendrasena. He also has similar relations with the Bhataris, the Alupas of south Kanara, and the Western Gangas. Upon his death, one of his sons splits away from the main kingdom and sets up the lesser kingdom of the Tripavarthas at Murod in Belgaum. Ravivarma's reign is marked by a series of clashes within the family (probably those of the Tripavarthas), as well as further clashes against the Gangas. Harisena of the Vatsagulma kingdom of the Vakatakas is killed by some of his own vassals while fending off an attack by the Ashmakas against the Banavasi kingdom. As a result, Ravivarma is able to extend his kingdom as far north as the River Narmada. The heartland of the kingdom essentially consists of most of Karnataka, Goa, and southern areas of modern Maharashtra. Harivarma is a contemporary of the Chalukyan king Pulakeshi I, who sets up his kingdom at Badami in 543, But in 525 it is Harivarma's cousin, Krishnavarma II of the Tripavartha kingdom of Belgaum, who defeats him and takes control of the kingdom, re-unifying the two branches of the family. However, to the north, Pulakeshi I is already asserting his dominance as the combined Kadamba and Tripavatha kingdom of Banavasi declines. Krishnavarma's successor, Ajavarman, is forced to submit as a vassal to Pulakeshi I, even though that dynasty's control over their kingdom is soon brought to an end. The descendents of the Kadambas continue to hold local power as regional chiefs, but only as vassals of other great powers. A branch later re-emerges in Hangal. The Triparvatha branch of the Kadambas broke away in 455 to rule from Murod in Belgaum for some time. During Harivarma reign, he was defeated by the Triparvathas, who then took over and re-unified the kingdom, but reunification was short-lived as the kingdom soon fell to the Badami Chalukyas. Son of Kakushthavarman and vassal of Banavasi. Harivarma of the Banavasi branch is defeated by Krishnavarma II, who takes control of the kingdom and reunifies the two branches of the family. The Badami Chalukyas began to assert their independence and rapidly rise to prominence as the combined Kadamba and Tripavartha kingdom of Banavasi declines. Ajavarman is forced to submit as a vassal to Pulakeshi I, but that dynasty's control over their kingdom is soon brought to an end. The descendents of the Kadambas continue to hold local power as regional chiefs, but only as vassals of other great powers. A branch later re-emerges in Hangal. The Kadambas once ruled a large kingdom around Banavasi in the region of Uttara Kannada in India, but decline set in and by the sixth century the Kadambas had been eclipsed. Between then and the tenth century they were little more than local chiefs. The founder of the Kadamba dynasty of Hangal was a vassal of the western Chalukyas. He re-established the Kadambas, and his successors enjoyed considerable independence, all but becoming sovereign rulers of Goa and Konkan until the fourteenth century. 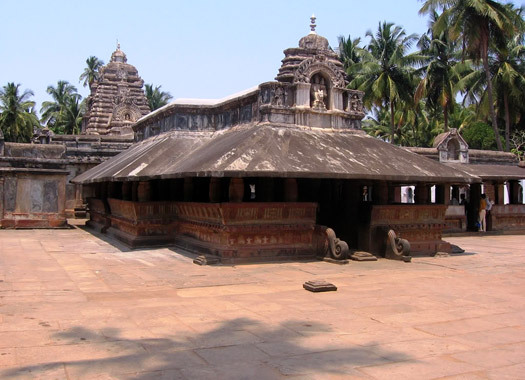 The successors of Chatta Deva occupied both Banavasi and Hangal, while the Kadambas of Goa formed a sub-branch that ruled there for around three hundred years. Interestingly, while the Hangal Kadambas were the main power, the titular kings of Banavasi, the true inheritors of the Kadamba name, were mere vassals at Uchchangi. Son, and founder of the dynasty. Minor branches of Kadamba rulers emerge at Bankapur, Bayalnad, Belur, Nagarkhanda, and Uchchangi, although they remain small in scale compared to the flourishing Hangal and Goa kingdoms. Son. Killed in one of the battles against the Cholas. Brother. Helped to rule by mother, Akkadevi. Fought against Cholas. The obscure minor branch of Kadamba rulers in Kalinga emerges. Son. Governor and king in Banavasi only. Kirtivarma serves his father as governor of Banvasi, but when his uncle gains the throne he declares Banavasi to be his own independent kingdom. After a period of civil war, the two are reconciled with Kirtivarma being able to keep his domains for his lifetime as he agrees to work together with his uncle. Kirtivarma instead fights against the combined might of the Kadambas of Goa and the Chalukyas when he tries to extend his borders. Ultimately defeated, he ends up becoming a vassal of the Chalukyas. The minor Kadambas of Belur probably fall at this time to the Hoysala dynasty. Despite the disagreement with Kirtivarma which disrupts the kingdom, Santivarma maintains his hold on the throne after the intervention of the Kadamba king of Goa, Jayakeshi I, who helps implement the solution that allows Kirtivarma to continue to rule at Banavasi. After the death of Kirtivarman of Banvasi, Taila II reunifies both the kingdoms of Hangal and Banvasi. He assists the Hoysalas against the Pandyas, defeating the latter. This turns out to be a mistake, as the Hoysalas (under Vishnuvardhana) are able to turn on the Kadambas, capturing Banavasi and later Hangal. Taila II is killed. Son. Continued resistance against Hoysalas. Brother. Drove out the Hoysalas. The dynasty comes to an end shortly after the Kadambas of Goa have been annexed by the Bahamani empire.